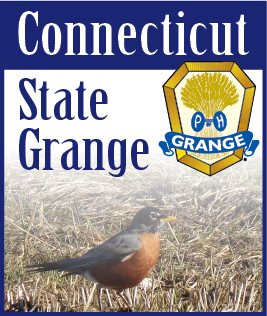 This edition of the Granger is packed with information about State Session being held 10/17-10/19 at the Norwich Holiday Inn in Norwich, CT. We are pleased to have some local sponsors for our session this year. Ekonk Hill Turkey Farm and the Brown Cow Café will be providing muffins and cider donuts for breakfast on Friday morning and The Farmers Cow will be providing the ice cream after the Sixth Degree. We are grateful that these businesses are partnering with us to make your convention more pleasurable. This year we have asked the Pomona Granges to sponsor one of the breaks. To date four Pomonas have agreed to do this and I thank them for their efforts. On Friday morning Quinebaug and New London County will be hosting the break time and on Saturday we will be hosted by Mountain County and Excelsior Pomonas. If your Pomona wishes to host, please contact me. You will find your Grange’s Session Committee assignment and the resolutions to date listed elsewhere in this edition. Please look them over and discuss with your members prior to session so your Grange can be adequately represented. This is a reminder to all who have late resolutions, any resolution approved in your Community or Pomona Grange and properly signed and sealed by your Secretary or Master after 9/30 will not be included in the Delegate’s Book. It will be necessary for your Grange to supply 120 copies during the session. After our session we roll right into Manchester, NH for the National Grange Session. Connecticut is responsible for Saturday November 16th. We still need Deputies, Registration helpers and help in the hospitality suite. Please contact Carol Hnath for more details and sign on to help. This is also an excellent opportunity to go to the Seventh Degree on Saturday November 17th. If you are ONLY attending the Seventh Degree you do NOT need to register with National Grange. As a reminder, East Central Pomona is having a bus go to National for the Degree. It is only $40. Call Edith Schoell to reserve your seat.